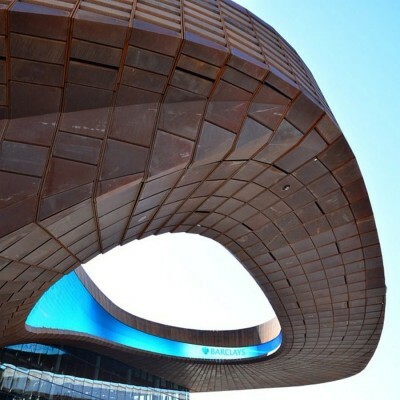 DISSIMILAR METAL DESIGN is confirmed as a 2014 ARCHITIZER A+ AWARDS Finalist in “Products + Facades” category for their “DMD Weathering Steel” patina on the exterior of the BARCLAY’S CENTER, New York, NY. SILVERDALE, WA, March 2014 – DISSIMILAR METAL DESIGN is proud to announce selection as a finalist in the 2014 ARCHITIZER A+ AWARDS in “Products + Facades category.” As finalists, we are competing for two awards: The Architizer A+ Jury Award and the Architizer A+ Popular Choice Award. The Architizer A+ Popular Choice Award is selected by a public voting process which starts today, March 4th and ends March 21st. Architizer received entries from over a 100 countries, representing the best of architecture worldwide. The Jury Winners and Popular Choice Winners will be announced on April 1st. Popular Choice Voting: All voting takes place at awards.architizer.com/vote. The Barclay’s Center Arena was constructed with a latticework composed of 12,000 pre-weathered steel “DMD Weathering Steel” panels created by Dissimilar Metal Design. The Weathering Steel was created by hand through weathering technology developed by Dissimilar Metal Design. Staying respectful to its urban environment, the rustic hued patinas are intended to evoke the image of Brooklyn’s Brownstones. Taking a cue from the Japanese Wabi-Sabi aesthetic, the tactility of the metal is designed to gracefully age without comprising the integrity of the cladding, and the façades will evolve with time. Architectural design by: SHoP Architects. Dissimilar Metal Design (DMD) is an architectural metals company based in Silverdale, WA, founded by Principal Mark Quinlan. DMD’s roots trace to 1981 with the creation and selling of bespoke metal furniture and sculpture commissioning for private collectors. DMD has spent the past 30 years dedicating to innovating weatherization techniques of metals such as Copper, Bronze, Aluminum, Stainless Steel and Zinc Patinas. Fueled by demand in Korea and Northern Europe, DMD expanded its operations with a new metal weatherization factory in 2006. They specialize in the creation of custom built decorative metal works, and the distribution of architectural panels for commercial and high-end residential projects. BROOKLYN, NY (September 21, 2012) – Bruce Ratner, the Chairman and CEO of Forest City Ratner Companies (FCRC), today joined Mayor Michael Bloomberg, Brooklyn Nets owner Mikhail Prokhorov, Brooklyn Borough President Marty Markowitz, Barclays Executive Chairman of the Americas Thomas L. Kalaris, senior executives from Forest City Enterprises, Brooklyn Nets CEO Brett Yormark, and other government officials and community leaders, including union officials and various signatories to the Atlantic Yards Community Benefits Agreement, to cut the ribbon marking the ceremonial opening of Barclays Center, the new world-class sports and entertainment venue that will serve as the anchor of the Atlantic Yards development, home to the Brooklyn Nets and the site of more than 200 planned cultural and sporting events annually. Barclays Center will officially open on September 28 with the first of eight sold-out concerts by JAY Z. The 675,000 square-foot arena, designed by the award-winning architectural firms SHoP Architects and AECOM, in collaboration with The Hunt Construction Group, the Design-Builder, consists of three separate but woven bands made up of 12,000 unique panels that were fabricated from 600 tons of steel sheets. The first band engages the ground where the weathered steel exterior rises and lowers to create a sense of visual transparency, transitioning into a grand civic gesture that cantilevers out into a spectacular canopy at the intersection of Atlantic and Flatbush Avenues. The canopy, which is 30 feet above ground level, contains an open, oval oculus that frames the pedestrian’s view of the arena. The oculus also houses a 3,000 square foot, 360 degree LED marquee. A second glass band allows for views from inside and outside of the arena. The third band floats around the roof of Barclays Center and varies in transparency, the weathered steel creating backlit patterns. BROOKLYN, NY (September 14, 2012) – On Friday, September 21, 2012 at 9:30 a.m., Forest City Ratner Companies Chairman and CEO Bruce Ratner will join Mayor Michael Bloomberg, Brooklyn Nets Owner Mikhail Prokhorov, Brooklyn Borough President Marty Markowitz, Barclays Executive Chairman of the Americas Thomas L. Kalaris, Barclays Center and Brooklyn Nets CEO Brett Yormark, and other government officials and community leaders to mark the official unveiling of Barclays Center, the first building that is part of the Atlantic Yards development in Brooklyn. The state-of-the art facility, designed by SHoP Architects and AECOM, will open to the public on September 28th with the first of eight sold-out concerts by JAY Z. For a full schedule of events visit www.barclayscenter.com. BROOKLYN (August 9, 2012) – Only 50 days until opening. Barclays Center, the most anticipated sports and entertainment venue in the world and the home of the Brooklyn Nets, will celebrate its Opening Night on September 28 when Brooklyn’s own JAY Z takes the stage. One of the key differentiating initiatives at Barclays Center includes having Disney Institute soon begin training 2,000 Barclays Center employees to provide the best customer experience for our patrons. In addition, Barclays Center will also soon announce its culinary program, which will be authentic to Brooklyn. As part of its volume and variety of programming, Barclays Center has already secured 209 events for the first year, highlighted by JAY Z’s eight sold out concerts, Barbra Streisand, the Brooklyn Nets inaugural game against the New York Knicks on TNT, NCAA Champion Kentucky vs. Maryland in the Barclays Center Classic, the Kellogg’s® Tour of Gymnastics Champions with the 2012 U.S. Women’s Olympic Gymnastics gold medal team, Disney on Ice, and the first major boxing event that is slated for October 20, whose card will be announced shortly. Barclays Center will also soon announce a more intimate theater for smaller shows within the bowl. 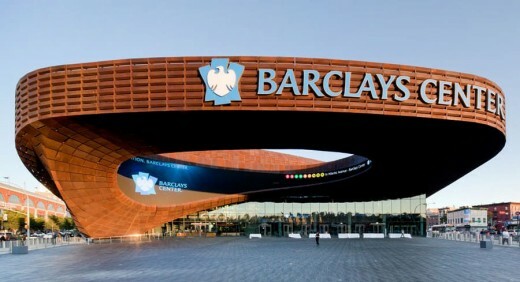 In addition, the business market continues to respond favorably to the opening of Barclays Center. By later this month Barclays Center expects to exceed 10,000 full season seats for the Brooklyn Nets, 80 percent of suites have been sold, and the arena plans to announce its 10th Founding Partner next week. The Barclays Center experience starts in 50 days. Brooklyn is getting ready.